It has a ruffled color and sleeves and ties at the neck with a satin ribbon. Waist length. Never worn- great condition. The slip declares itself to be Charmode miracle blended of dacron-nylon-cotton. VTG Pretty 50's 60s Mint Green Night Slip Dress. Lovely nylon with lace and ribbon rose detailing. Very pretty. Sale is final no returns. Thanks you. New ListingStunning Vintage 1950s/60s Warner Laros Sheer Nylon Deep Lacy Slip Petticoat 34"
Vintage ROGERS Full Slip Nylon TRICOT Coral/Red Lacy Ruffle Size 34 GORGEOUS! Item sold as is due to the age of item. Sheer fabric with embroidered flowers. The elastic waist stretches from 32-36" and the length is 28". There is a satin binding on edges of hem layers. Due to the age of this item it has yellowed but no stains or holes. Label: Vassarette Made in USA. This slip is perfect for that great va va voom pinup girl silhouette. Truly a must have for any pinup vixen. lace is soft and comfortable on the skin; no itchy lace here. Luxurious fabric construction of nylon for matte finish with satin feel. (does have stretch) Across directly under bodice waist are (smallest part of the slip). Chest arm to arm apx 19" (38). This slip is Pristine White. FORMFIT ROGERS. RED HOT RED LACY BODICE. 2" wide lace hemline. SILKY NYLON FULL SLIP. Length top of strap to hem: 38". Size 32 (X-Small). Length from the pit down is approx. STYLE: 8334. 2" LACE AT BOTTOM HEM. SIZE: SMALL. 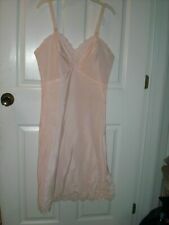 Vintage 1950s Pretty Pink Nylon Tricot Full Slip w/Accordion Chiffon-Lace Trim. This slip is perfect for that great va va voom pinup girl silhouette. Truly a must have for any pinup vixen. peek-a-boo semi sheer breast area with lace trim at the top & bottom. bottom of slip has sheer lace trim with a wave-like pattern on the top. This crinoline has an elastic waistband. Lovely lace roses detail the bodice and the bottom has a fabulous pleated ruffle. I do not know the maker. The size is 34 average. Antique white color Tricot all nylon half slip lingerie embellished with delicate floral lace, elastic waist band. VANITY FAIR. This beautiful slip is light, soft & silky to touch! LENGTH: 25". Get images that. Across underarms: 16" apx. Colors: Red. VINTAGE 1950’s Cotton Slip WHITE Size 34. BEAUTIFUL 100% cotton slip with adjustable straps. Full coverage of bust area. GREAT vintage condition- no major flaws. Perfect as-is, or dye it to match your wardrobe! Bust: 34” Waist: 31” Hips: 40” Length: 42” Shipped with USPS First Class Package. FABRIC: ACETATE & LACE. THE ITEM WE HAVE HERE IS A 1950s HALF SLIP. DOUBLE PANEL CAN BE WORN EITHER IN THE FRONT OR BACK. CONDITION: VERY GOOD, LIGHTLY WORN. SEVERAL SMALL PRICKS AND PULLS FROM HANDLING. 2 1/2" LACE AT BOTTOM HEM WITH 14" LACE ACCENT SLIT ON LEFT SIDE. SIZE: LARGE. 34" LENGTH FROM WAIST TO BOTTOM HEM. Adjustable Strap. Taffeta Look 50% Nylon 50% Polyester. Formal length nylon half slip. This slip is perfect for that great va va voom pinup girl silhouette. Truly a must have for any pinup vixen. breast area is double-lined; first layer is sheer chiffon & second layer has lace & embroidery. This slip is perfect for that great va va voom pinup girl silhouette. Truly a must have for any pinup vixen. lace is beautiful, intricate, & very feminine. lace is soft and comfortable on the skin; no itchy lace here. Very pretty just off white cream colored dress slip. a Bryn Fit Tafredda style from Barbizon! Lace is stretchable. Stiff, swishy skirting with center front & back panels and white lace hem trim. Fabric: Tafredda. Fabric :100% Silk - Lace Trims - Silk Ribbons trims. Style :Woman Skirt Slip. Waist :20 ( unstretched ) up to 26. Fabric :100% Silk - Lace Trims - Silk Ribbons trims. Style :Woman Skirt Slip / Half Slip. Waist :20 ( unstretched ) up to 28. Vintage 1950s AristoCraft LACY BLACK NYLON FULL SLIP -sz 36 black with brown trim. Great condition. Shipped with USPS First Class Package. Vintage lipstick red nylon full slip with metal sliders on the satin straps. Sheer floral lace bust lined in nylon. The scallop hem is trimmed in lace. The slip is in good vintage condition shows minimal wear except for small spot on the back which is shown in the last photo. Designer is Vanity Fair and is marked a 32 but please refer to the measurements for the best fit.Bust 34"Waist 27"Hips 36"Armpit to hem 32"
Pinked seams, 6 skirt panels around. Just gorgeous! Hem: 27" (across lace band). Bust, Underarm to Underarm: 17". Length - 19" (add 1" for scalloped lace). Excellent condition! No signs of wear. Elastic is still great! 100% Nylon. Waist - 22" - 32" (unstreretched - stretched).